I wrote this guide for students in my Spring 2014 section of Ling-L 306, an undergraduate introductory Phonetics class at Indiana University. As such, some of the information is particularly focused on that specific class and on LINGUISTICS in general, and is particularly relevant to students at IU. That said, a great deal of the information is universally applicable and will be useful to non-linguists and to non-IU students. A. First considerations when getting ready to do research. When you first start thinking about doing research–for a class presentation or paper, for a final project, or for anything else that may come across your desk–one of the earliest tasks you will have is to determine where you should look for appropriate resources. That, in a sense, is your first question: where should I begin searching? Something you should learn right away is that a google search is almost never going to be the right answer to this question. While a google search may guide you to some additional resources, you want to think about academic searching as a different enterprise than the kind of searching you do on google. If you need to find a store that sells the particular brand of dog food your folks asked you to buy for Max the new puppy? Sure, use google. If you need to find resources for an academic paper, however? You want to think about the library and about academic databases. In a linguistics course, often you will be searching for resources related to languages. As such, you should check the library catalogue to see whether there is a basic descriptive grammar for your language in the library. If there is, and you need any kind of basic linguistic information about a specific language, this is probably the best and easiest solution. Go to the library, and get a physical book. A good question. A descriptive grammar just may be your best friend when trying to do this or any other basic linguistic research. A descriptive grammar – also known as a linguist’s grammar – lays out the basic structure and rules of a language to greater or lesser degrees. As such, there should be a section on phonetics that tells you what the language’s consonant and vowel inventories are. This will most likely include a whole list of example words. If the grammar is published somewhat recently, example words and other language data in the grammar are likely to be in IPA. For this reason, when facing a linguistics assignment where you need to find basic information about a specific language the single easiest way to get the research accomplished in a timely, painless manner is probably going to involve checking the library catalogue for a physical book . 2. In terms of databases, there are two that I would consider the first options, or best priorities, in your search for a reference. This is certainly true for the final project in Ling-L 306, and is almost certainly true for many other linguistics research projects as well. LLBA – the Linguistics and Language Behaviors Abstracts database. (You can find this by clicking on the Resources Gateway tab on the libraries homepage, then clicking the “Resources A-Z” link and clicking on “L” to get to the list of databases that start with “L”. Finally: try Google Scholar, too. Many times Google Scholar will yield surprisingly good results! When you search, one of the most important things you can do is use appropriate, accurate, precise search terms. If I am searching for data related to Portuguese vowels, then, one of the things I need to know right from the start is whether I am trying to find info on Brazilian Portuguese or European Portuguese. Hold up! Why do you have quotes and the word AND in your search terms? Quotes: When you put things in quotes, like “brazilian portuguese”, it tells the search engine that you are interested in those two words as a complete string. You’re not interested in ‘brazilian’ alone, nor are you interested in ‘portuguese’ alone: no, you specifically want to find the complete phrase ‘brazilian portuguese’. The asterisk in the final three search term examples is called a wildcard. This is a form of truncation: using the wildcard tells the search engine that you want it to return any results that contain that root, regardless of how it ends. In the case of “phon*”, then, the search will return anything that starts with “phon”: phonetic, phonetics, phonology, phonological, phoneme, etc. NOW, You may wonder, why should you bother searching for “phonet*” and “phonolog*” if “phon*” will return the same hits? This is something I do not fully understand, and a trained research librarian would be better suited for explaining this to us. The short story, though, is that I do this because the order in which the results are returned to you may vary, and you may see something on one search that you missed on another. Note that the symbol used for truncation may vary from one database to the next, but you can always learn which symbol to use by checking the specific database’s help screen. D. How to weed through the search results. Great: you’ve found a database and done a search. Now how do you know which articles are likely to be of use? There’s no easy answer to this: what you want to do will vary depending on your assignment, your needs, your interests, and so forth. For the purposes of Ling-L 306, however, what you need to do is find a dissertation or an article that clearly lays out the consonants and vowels of the language you are working with. Ideally, this will be in the form of an IPA chart – something that looks familiar to you, something that looks like a lot of the other charts we have seen in phonetics. It may also come in the form of a list, however, so you may need to just pick some likely articles and start scanning through them. If someone has written a grammar of the language you’re working on as their dissertation, it will almost certainly include consonant and vowel inventories along with thorough lists of example words. The kinds of things you are looking for: a good listing of consonants and vowels in a way that you can interpret, accompanied by a good listing of sample words. E. What are your options if you’re having trouble tracking down a copy of the article? Imagine that you have found an article which seems like it would be great. You’ve tried clicking the IU-link button, but IU doesn’t seem to have access to a copy of the article. Double-check to make sure that the database does not include a “full text PDF” link right inside the record you’re examining. Copy the title of the article. Keep your fingers crossed that it will pop up with a link to a pdf. 4. You can also search the IU Catalogue to see whether the library has hard copies of a journal in the stacks. If so, you may be able to track down an actual physical copy of the article. 5. You should also be prepared for the fact that there are times when the hunt for an article fails. Sad but true: sometimes there are articles that we just can’t get our hands on. If you come across this, just move on and keep hunting for another article. WHAT do you need to cite? Basically, any time you include information or make reference to information that is not purely, inarguably, unequivocally a part of the general knowledge of the general public, you need to include a citation. That means we can say that Barack Obama is the President of the United States: this fact is broadly known, and we do not need to include a citation. If I wanted to say something about his age or his birthdate, however, then I would need to include a citation. Why? Because I do not know President Obama’s birthdate off the top of my head: I would need to consult a source to learn this information, and that source would need to be cited. FOR YOU: this means that you should include a citation INSIDE the first sentence that includes a fact you did not know with certainty before doing research. In addition to the inline citation, full bibliographic information should be included at the end of the paper, in a Works Cited/References section. The full citation for Dhongde and Wali reads: Dhongde, Ramesh Vaman & Kashi Wali. (2009). Marathi. Amsterdam: John Benjamins Publishing Co.
G. HOW do you need to cite? As mentioned above, you need to include inline citations (Author, year) whenever appropriate, and then add a full bibliographic entry for whatever sources you cited in-line in a References section at the end of your paper. Purdue has a very good resource page which will give you clear overviews of a few different citation styles. You can find this page here. This is an amazing resource and I highly recommend saving the link for your records. I think you will find it useful in future courses. H. What happens if you fail to cite? Failure to properly cite your sources is academic misconduct. If you don’t cite your sources, you are plagiarizing: you are presenting someone else’s material as your own. It’s cheating, and you can, should, and probably will be reported for it. The consequences for academic misconduct run from very minor to very severe: it can result in a mere admonishment, in receiving a failing grade for a course, in expulsion, and – in rare cases – people’s diplomas can be revoked if they are found guilty of plagiarism after graduating. In other words, it is a BIG DEAL and you should take it extremely seriously. The IU School of Ed has a truly excellent web resource that will educate you about plagiarism. You can find it at https://www.indiana.edu/~istd/. I cannot recommend this tutorial highly enough: you may find it slightly repetitive, but you will benefit from it immensely. People commit academic misconduct unintentionally all the time, and this is something that can absolutely affect your future. I beg of you: do not be ignorant on this topic. People aren’t automatically good at research: it is a skill, not a gift, and you will get better with practice. Searching for academic resources works differently than doing a google search; they are tangentially related, but they are not the same thing. As such, it basically doesn’t matter that you know your way around Google. You should still approach this kind of searching as though it is a totally new skill. Don’t be frustrated when you run into walls: just go back to the basics, brainstorm some new search terms, and try again. The worst thing you can do is to be intimidated by this sort of research: it’s something that will serve you well in your academic career, so the sooner you start playing around with it and developing proficiency in this new type of searching, the better it will be for your long-term academic well-being. Do NOT leave yourself with too little time: learning to navigate academic databases is like learning to use a new kind of software, or a new piece of technology. Like those endeavors, you will be most successful and make the most progress if you give yourself time to play around, explore the various databases, try out various combinations of search terms, etc. The more you do it, the easier it will become. I promise. That said: I am truly an expert at this kind of research. I spent eight years earning two master’s degrees and a PhD, which translate into an unthinkable number of hours spent wading through databases and articles and grammars. And yet, as some of you have seen, I can still get frustrated at times! Sometimes the only resource that exists is a book that was published in 1923. Worse yet, sometimes the work just isn’t out there. The thing that you should keep in mind, though, is that that is the exception. While it’s true that finding resources is sometimes difficult, more often than not it just takes a little bit of time, effort, and patience. This is probably the primary thing that distinguishes an expert from a novice: an expert knows that failing to turn up a good result on search number 1 is not a sign that you are doomed to failure. Instead, it’s an invitation to try again: to dig deeper, to search harder, and to get more creative with search terms. So: dive into it. Give yourself plenty of time. Don’t let one fruitless search make you sad. Don’t be intimidated. Do play around with search terms. Do try different databases. Do peruse multiple articles. Do try to find a descriptive grammar. And – as much as is possible – have fun with this. Very few people on the planet get to go tool around a library as part of their job. For at least these years while you are in school, you are one of us lucky few who can legitimately do so. You can put time into seeking knowledge. You can browse through the stacks and stumble upon grammars of languages you didn’t know existed. Try to enjoy this luxury! I’m prepping to help with a professionalization workshop at the end of the week – and I was on the job market somewhat recently – so I’ve got job-hunting on the brain. Here, in no order of importance and with no pretense of being comprehensive, are a few of the things that I consider to be important when job-hunting in academia. Today I’ll talk about how to learn about – and then keep up-to-date about – job possibilities. Topics like cover letters, etiquette, and being sane will come later. Do all the no-brainer stuff. Organizations in the relevant subfields, such as The Acoustical Society of America and The Society for the Study of Indigenous Languages of the Americas. Check the job-listings posted on those sites regularly: get the Linguist List Daily email Digest, and read it. Join a job listing site like SimplyHired.com and set it up so that you receive alerts when new jobs are posted. I get three different simplyhired alert digests emailed to me each day. 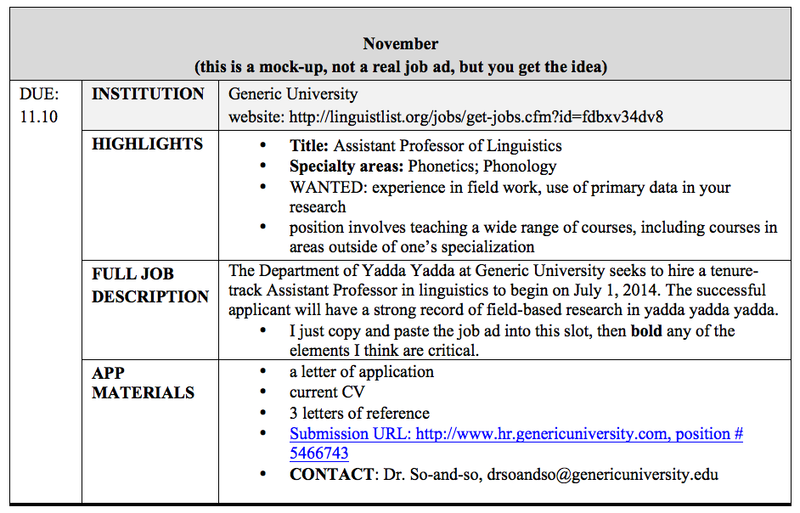 One is for the keywords “professor + linguistics” – this one includes all of the job ads that have the words professor and linguistics in them. I get a lot of repeats on here, and most of the jobs also appear on another one of the sites I watch – The Linguist List, really, is the premiere linguistics job listing site in the world, as far as I know. Every now and then something new shows up, however, so I keep on reading this. A second alert is for all job ads containing the search terms “postdoctoral + fellowship”, and this one often contains things I would not have known about otherwise. I worry that a lot of people who are just finishing school, or just barely out of school, don’t search for post docs, and I think that is a mistake. Most of us are going to end up in post docs right out of school. If you end up in a tenure track position right away, good on ya – it’s not the norm, though, so don’t forget to look for postdocs. The third is for ads containing the terms “Boston + linguist”, because hey: a girl can dream. The point here is that it never hurts to get a little creative: whatever it is you think you want to do right out of school may or may not work out, so you want to find a way to tap into as many job ads as possible. That’s not to say that you should apply for every single thing that comes across your screen – you don’t want to go crazy, after all. But if you are looking for a job in academia, then you have either just completed or are about to complete a research degree. Put those research skills to work in job-hunting, and look for possibilities. Bookmark the relevant wikia site(s), and check it/them with just the right amount of regularity. The 2013-14 Linguistics wikia is here. This is an amazing resource…even if you’re not on the job market this year, you can check it and previous years out to see what kind of jobs are up, how things change from year to year, when deadlines tend to be, when interviews tend to happen, et cetera. There are wikia pages for all kinds of academic jobs out there, so if you’re not in linguistics then just look for the relevant page. Don’t forget the Dissertation Fellowships wikia – again, even if you’re not dissertating next year, it’s not too early to check out the wikia and see what kind of opportunities you might want to try for in the future. While we’re at it, you should also check out the 2013-14 Humanities and Social Sciences post docs wikia. The most important thing I can say about the wikia pages might be this: Don’t be a lunatic. Sure, you’re anxious about whether anyone has heard anything from College X. Sure, we all understand that you might want to check the wikia every 37 seconds, just in case anyone has posted something. But please, don’t let yourself do it. You have to maintain a little bit of distance. Use these things as resources, but don’t get obsessive about checking them. Talk to people. Make sure that people know that you are on the market. Don’t be creepy, but do be pro-active. Go to conferences; present your research; make and nurture connections. AND – critically – keep an organized, running list somewhere. I create a document each year called something like “Jobs to Apply for 2014”. It’s organized by month and by application due-date, and contains what I consider to be the relevant info. When I find a job that seems like a reasonable possibility, I add it to the document right away. I may not end up applying for every single thing that goes into the document, but if I keep all relevant information nicely organized in the same place then I know I can always come back to it later. So, with regards to finding jobs to apply for, the above points do a pretty good job of covering the bases. I’m sure there are things that I don’t do that would be helpful, so feel free to chime in if you have more suggestions. I will say, I think it’s important to approach this seriously, and to be prepared to put time into seeking. Searching for jobs to apply for may seem like a really small part of the process: after all, simply browsing through job ads is easy. Writing the statements, figuring out how to present yourself: those are the hard things. Right? But searching is the first step in the process, and it’s something that will go better for you if you have a little bit of an agenda. So develop a habit: put 10 minutes of your morning coffee-and-internet time into job-hunting. Do it every day, or every weekday, if you’re on the market now. Do it once a week if you’re a year or 18 months out, or once a month if you’re still years from finishing. Do make it a part of your routine, though. Scan things. Keep an eye out. It will help you to be more aware of the trends in your field, and it will mean that you’re better prepared when the time comes to actually hunt.